To not know of this series in terms of its anime and manga success is like living under a rock for the last fifteen or so years. Dragon Ball has been one of the most successful titles in Japan and abroad. There have been 42 volumes of the manga, and as the manga finished its run in 1995, The Completed Illustrations Artbook was published. 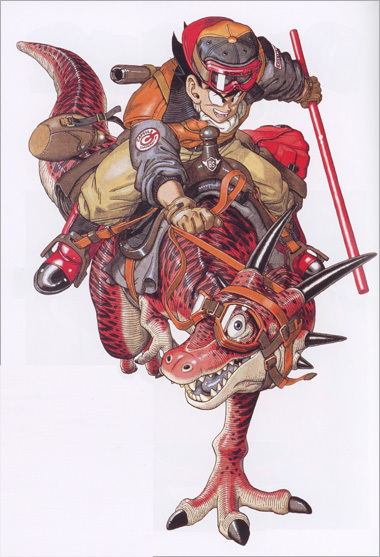 More than a decade later, the popularity of the series is still immense, so Viz in the United States was able to publish and make available this art book for English readers. Akira Toriyama's popularity was cemented for many anime fans as his work ultimately became a starting point for many anime fans. In a yearbook format chronicling the years of 1984-1995 are Dragon Ball and Dragon Ball Z drawings that are reprints from original Weekly Jump artwork. There are annotations that would indicate the reasons for their significance. But what is more important is the viewer's ability to see the development and evolution of Toriyama's work over the series. There is growth of Dragon Ball's large cast, and the villains that Goku and his friends would ultimately face. Toward the end of this art book, there is a collection of Dragon Ball covers, spine art and the Japanese Shone Jump covers that the series had graced over the years. There is also an interview Akira Toriyama himself, with some interesting details and artwork of how he portrayed himself as the author in the manga. 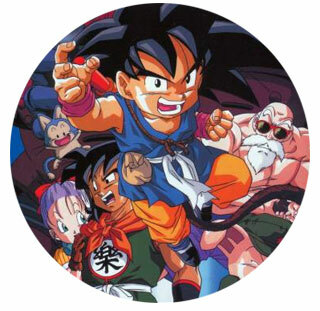 Dragon Ball began as an inspiration from Chinese classic, Journey to the West, with Son Goku on a journey of searching for the seven dragon balls. As the manga matures, the plot draws away from this search, and continues with the development of Goku as a protector for people important to him. This is a concept that is familiar with fans of the series, as the series becomes an action genre title. To have this Complete Illustrations is a summation as well as a memory keepsake for a much loved series. 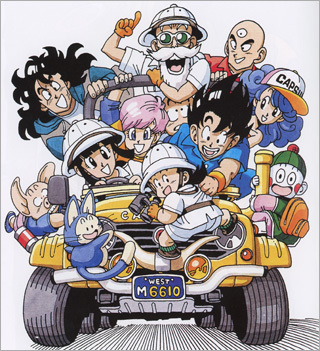 Below: An illustration from Dragon Ball: The Complete Illustrations. The setting is a grim, terrifying world. A place filled with grief, agony and far-reaching destruction. Vast cities and whole countries are in ruins, filled with the stench of death. Hopelessness has seeped into every nook and cranny on the planet. And the source of all this strife are two androids, determined to snuff out every last bit of civilization, rendering humanity extinct. Only two super-warriors stand in their way-the Z martial artist Gohan, and his teen-age apprentice Trunks. Their fellow Z warriors have all been killed by these androids, whom possess unimaginable strength and are virtually unstoppable. Gohan and Trunks are the last threads of hope humanity has. Will they be able to save the human race from total annihilation? This gripping tale is a peek into an alternative world of the legendary anime series, Dragonball Z. It is the back-story of how Trunks came to be. Gohan and Trunks have their work cut out for them, as they battle the male and female androids 17 and 18, originally sent to earth to kill Gohan's father Goku, who died of a virus before they were activated. The androids instead set about destroying the earth, taking cold-blooded pleasure in their destruction and endless carnage. The action comes at you in relentless, pounding, tsunami-like waves, shaking you to your very core. The story is the classic saga of fighting tooth and nail against adversaries possessing fearsome power-a power so vast and monstrous in its totality that victory is all but lost. And yet, the Z warriors draw further strength from within, not giving an inch, not surrendering in any aspect whatsoever; determined to sacrifice their very lives to ensure victory. Be sure to pick up this DVD! Join Gohan and Trunks in their epic battle against the androids, as they battle for the fate of planet Earth! This boxed set of films contains the three best of the 13 DBZ movies, uncut, "Dead Zone", "World's Strongest" and "Tree of Might", and is an awesome addition to any DBZ fan's collection. "Dead Zone": Garlic Junior and his quest to gain immortality while also fufilling his father's dream of transforming the Earth into a world of pure evil. Funniest DBZ movie, and with the most characterization. "Tree of Might": A Sayian's quest to become the strongest person in the universe with the fruit from the tree of might that only the eternal dragon is allowed to eat from because it gives enormous powers to whom ever eats from it. Saiyan VS Saiyan action! With each new generation of console, these games get closer and closer to looking like you're playing the actual show. At this point, the High-Def capabilities of the Xbox360 and the PS3 have made it so that you no longer need the show itself -- you can create new episodes right out of the game! Dragonball Z Burst Limit is the first game of the Dragonball Z series to hit the next generation consoles with key game features including online play, detailed 3D graphics, enhanced playable characters, and realistic battle fields. During each battle, players can utilize conditions to create new dramatic scenes, and then watch a unique story unfold after each play. There are stronger elements of offense and defense, due to added energy saving and fighting techniques. Dragonball Z Burst Limit blurs the line between videogame and iconic anime series creating a new genre of 3D fighting games. In America, DBZ games have been few and far between. However, the popularity of the TV series has convinced ATARI (of all companies!) to bring out this killer app of a game. Faithfully recreating the series, not only in look, but in using the voice actors we're familiar with, the game goes far and beyond what you'd expect. It's a fun fighting game with a plethora of characters, but it's also a very cool interactive version of the show itself — the story mode summarizes everything from the Saiyan Saga through to the Cell Games. For fans of the series this game is a godsend because just about every character is represented. Sure, we all like playing Vegeta, but how many games can you name where you can play as Tien or Great Saiyaman or #18 (yum!)? Half the fun of the game is throwing someone into a mountain, or performing a Kamehameha. Videogame inspires TV Show inspires Videogame. Pop will eat itself!